Did you get it? Hammer, because one of the online shooter’s operatives has a hammer and you can smash holes in walls with it and then shoot people in the head through the holes. I’m hilarious. Anyway, Rainbow Six Siege is free on Steam this weekend, from now until Sunday, April 17, at 1pm PT. 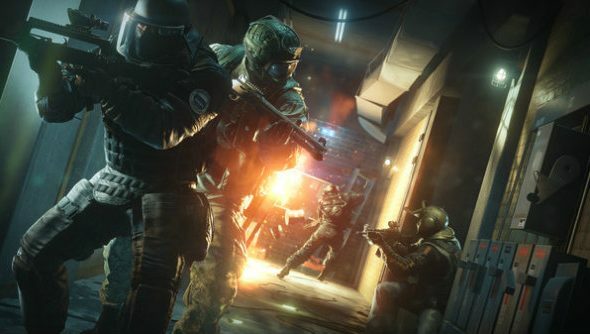 Rainbow Six Siege is great, just like the other games in our best FPS list. Ubisoft’s tactical shooter is fully available on Steam and Uplay to try out now, and if you like the game’s distinct pace, with its tense, deadly shootouts and tactical preparation phases, you can pick it up to keep at a 33% discount. I hope this promotion boosts player numbers, as it really deserves to be played. However, the timing isn’t the best, what with the Doom open beta dominating this weekend. We’ve also got the lowdown on the Doom beta start times, access details, maps and modes. If you’re wondering how Ubisoft’s shooter is on PC, why not read our Rainbow Six Siege PC port review. You should try it anyway, mind.